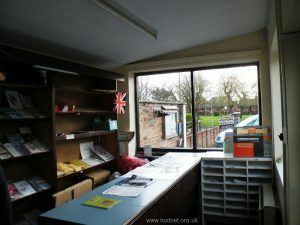 There had been a shop and a garage on the Station Road site prior to 1960, but the story of the Post Office begins on 1st December of that year when Mrs Sarah Sargeant was appointed Postmistress. Gina Sargeant and Kath Brown understand that mail was sorted in a shed on site, and local delivery people used to come along to collect their portion of mail to deliver. Mrs Sargeant’s daughter Beryl Whiston also helped from time to time, and later on a Mrs Hamblin from Marchamley worked there. In 1978 Gina Sargeant began to stand in on a Wednesday when Mrs Hamblin was absent. Mrs Hamblin left in the late 1980’s. Beryl returned to work and remained till the late 1990’s. Once Beryl had left, Gina became more or less full time. From April 1995 Kath Brown joined the staff. Prior to this Kath had worked for Mr and Mrs Gough in the shop where the Post Office is now, then at the village chemist’s, then at the doctors’. 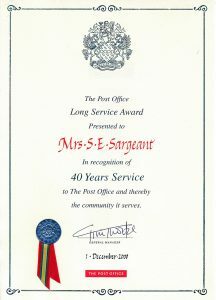 Mrs Sargeant died in 2002 aged 87, still officially designated Postmistress. 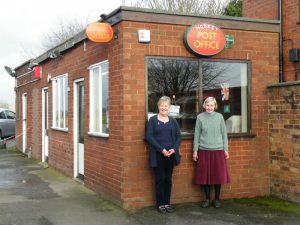 Gina’s and Kath’s years of Post Office service saw immense changes in the way business was conducted. They both have vivid memories of the first day computers were in use (May 2000). At 85 Mrs Sargeant decided that computers were not for her, but she sent the “girls” along to Telford for training in these new magic arts. Kath received one day’s tuition, Gina a day and a half, then it was in at the deep end. A Trainer accompanied them behind the counter on the first day of business – a Monday, the busiest day of the week – and Gina had to make a note of all his instructions whilst Kath fielded all the customers and the new computer single-handed. They left work that day with their heads buzzing. Apart from the Trainer returning to assist with the first balance, the girls were in it on their own after that, and in fact copies of Gina’s scribbled notes on how to manage the new equipment were in great demand from colleagues at other Post Offices. They made more sense to them than the official manual! By the time a safe and new security measures had been installed, Mrs Sargeant had had enough and she left the girls to it completely from August of 2000. They have fond memories of the old ways in which things were done, and Gina still has a stick of sealing wax and a blue crayon for marking registered parcels. Royal Mail and Parcel Force were not separate business in those days – all the mail went into one bag, no pre-sorting, no bar codes, no computerised transactions. Pensions and allowances were paid out weekly in cash, and you had to present your book to be stamped. Woe betide anyone who tried a spot of fraud though – there was a “Stop” notice behind the counter giving details of dubious pass-books and Giros which were not to be cashed, and Gina and Kath learned to keep a watchful eye on that list when they suspected any dodgy dealing on the other side of the counter. Originally the counter faced Station Road, with direct access behind it from the outside. 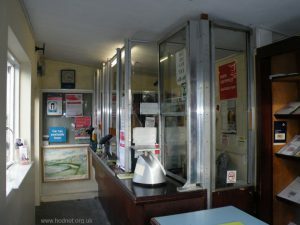 In those days there were no high security screens, but the time came when Post Office policy changed and these needed to be installed. They arrived unassembled and local joiner Jim Williams was commissioned to build a new counter and secure the screens on it. It was at this time that the counter was re-sited to the position most will be familiar with. This also meant there were two doors for customer use which was essential at busy periods, given the narrowness of the space on both sides of the counter! Mick Sargeant’s vehicles for his Prison Service work were based at the Station Road site too, so there were plenty of comings and goings every day. He had been in that line of work since Stoke Heath opened in the 1960’s, only later shifting to private hire work. Having Mick and the drivers around on site was a reassuring back-up to Gina and Kath on more than one occasion when they had an awkward or suspicious customer to deal with. The shop area. Gina says that originally it extended to the end of the wall with the noticeboard on it. 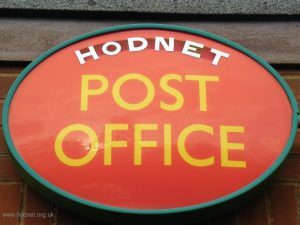 Hearing their reminiscences is a confirmation that the Post Office was indeed a community centre, where joys and sorrows, news and jokes were shared day by day. Of course it’s the frightening or memorable instances rather than the daily routine which stand out as they look back, but generally speaking Gina feels that they were pretty lucky. Yes, there was the odd out of hours attempted break-in and on one occasion in the 1990’s they felt sure the premises were being cased for a robbery. The group of youths returned later in the week but the ladies stayed firmly behind their security screen and Mick stood by the door wearing the biggest coat he had in order to increase his presence. Not knowing how to handle the situation, the gang decided to leave and Mick reported their suspicions to the police. As it turned out their hunch about those guys was spot on, as the PO at Tilstock was to discover to its cost half an hour later. The qualities needed to do this job well are many and various. A good head for figures, an efficient way of working, the ability to keep calm under pressure, an interest in people as people not just as customers in a queue, a touch of intuition about those who try to beat the system and the courage to call their bluff, a shrewd judge of character…. 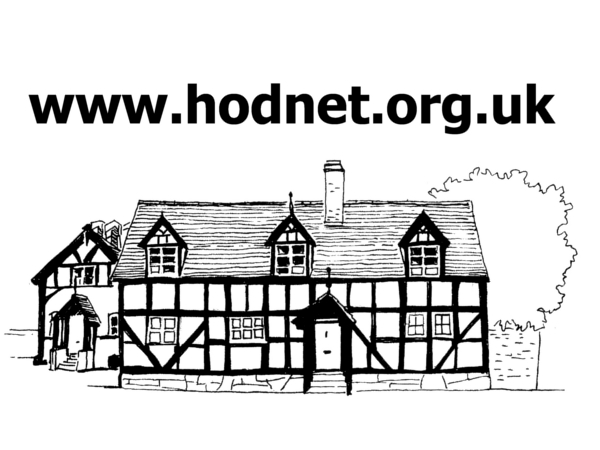 one could go on, but in the end anyone living in Hodnet over recent years has seen all this in action, personified in Gina and Kath during their own chapter in the story of Hodnet Post Office.